Written on 18 November 2014 . 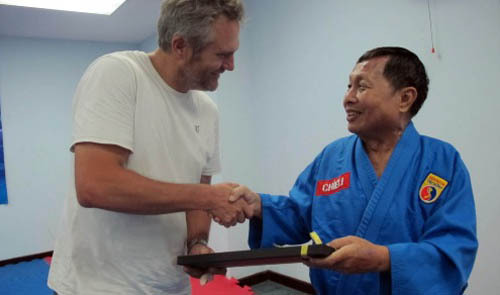 Nguyen Van Chieu, the master of Vietnam’s martial arts discipline Vovinam, will be featured on the ‘Human to Hero’ program of the U.S.-based international TV channel CNN on Novbber 26 and 27. A CNN camera crew visited Ho Chi Minh City and recorded images of the master and his instructors while training and teaching techniques at Phu Tho sports house on Novbber 8. They also filmed a series of spectacular acts of attacking and defending performed by the master and his fellows. In a letter sent to Nguyen Binh Dinh, deputy general secretary of the Southeast Asian Vovinam Federation and Vietnam Vovinam Federation, CNN announced that the feature about Vovinam and master Chieu will be aired at 12:00 and 22:30 (GMT) on Novbber 26 and 27. The show will also be posted on the CNN website at www.cnn.com/humantohero. CNN is broadcast to 380 million households in Europe, Africa, the Middle East and Asia, according to the letter. ‘Human to Hero’ attbpts to get to the heart of what it takes to be a sports star by exploring the discipline, dedication and determination involved, as well as the sources of inspiration for the world’s best athletes. Nguyen Binh Dinh is the son of master Chieu. Chieu has traveled to around 20 nations to teach and popularize the Vietnamese martial arts. Vovinam is practiced with and without weapons, based on the principle of staying between hard and soft, using the force and reaction of the opponent to counterattack. It includes hands, elbows, kicks and leveraging techniques for both attacking and defending.